One German Jewish leader has called the result in the weekend election in Berlin a "Nazi renaissance," as Germany's newest right-populist party, Alternative for Germany, or AfD, gained seats for the first time in the state parliament. The anti-immigrant, anti-EU party has been plagued by controversies over anti-Semitism in its ranks, the Jewish Telegraphic Agency reported, as it finished fifth in Sept. 18's vote with 14.1 percent in Berlin. Germany's capital has long prided itself on being a trendy, diverse and multicultural city, the European Jewish Press reported. The strong AfD showing was due to support especially in the vast tower block districts in Berlin's former communist east, and means it has now won opposition seats in 10 of Germany's 16 states, a year ahead of national elections. Founded in 2013, AfD, as the party is known, has clinched its seats in the legislatures of the states following several elections this year. The winner in the Berlin election was the Social Democratic Party (SPD), which retained power over the party of German Chancellor Angela Merkel, the Christian Democratic Union, with 21.6 percent of the vote to 17.5 percent. The head of the Central Council of Jews in Germany, Josef Schuster, told the German news media after vote counting that the results were worrying. A former council president, Charlotte Knobloch, who heads the Jewish Community of Munich and Upper Bavaria, issued a statement urging Germany's "Democratic parties to make good use of the time between now and the next elections in 2017 to stop the Nazi renaissance." Knobloch is a Holocaust survivor who hid as a child in Bavaria and called AfD "a party that incites against minorities in a disgusting manner, that wants to make National Socialist terminology and approaches acceptable again, that is unable to distance itself credibly from neo-Nazis and Holocaust deniers." She described its gains in state parliaments are a "true nightmare." If the established parties don't manage to gain support by the national elections next year, Knobloch warned, "I fear for the good and peaceful future of our country." In July Wolfgang Gedeon, a former doctor turned AfD lawmaker in the southern state of Baden-Wuerttemberg, triggered outrage by saying that denial of the Nazi Holocaust, in which six million Jews were killed, is a legitimate expression of opinion, Reuters news agency reported. Holocaust denial is a crime in Germany. 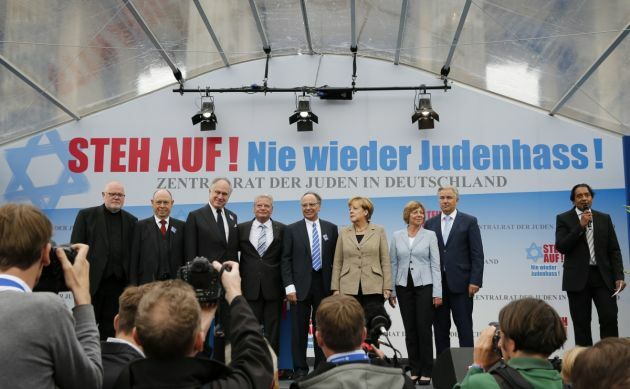 "The voters don't realize that they're going to vote for a party that doesn't want to differentiate itself from the extreme right," said Josef Schuster, president of the Central Council of Jews in Germany, EJP reported. Rabbi Yehuda Teichtal, rabbi of the Orthodox Jewish community of Berlin, stressed that ''the establishment of the EU and the multi-cultural approach it symbolizes, contributes to the welfare of Europe's Jewish communities." "Therefore, the possibility of dismantling the EU and reverting back to nation states should worry all Jewish people around Europe. A strong European union is of paramount interest to the Jewish people of Europe in general and to Jewish people of Germany in particular." Berlin is a chronically indebted city-state of 3.5 million people and the poll was dominated by local issues including poor public services, crumbling school buildings, late trains and a housing shortage, along with problems in coping with the recent migrant influx. More than 70,000 of the asylum seekers came to Berlin, with thousands still housed in the cavernous hangars of former Tempelhof airport that was built in the Nazi era. Berlin's SPD Mayor Michael Mueller had warned before the polls that a strong AfD result would be "seen throughout the world as a sign of the resurgence of the right and of Nazis in Germany." AfD leaders were jubilant at the prospect of occupying 25 seats out of 160 in the state parliament of Germany's capital. 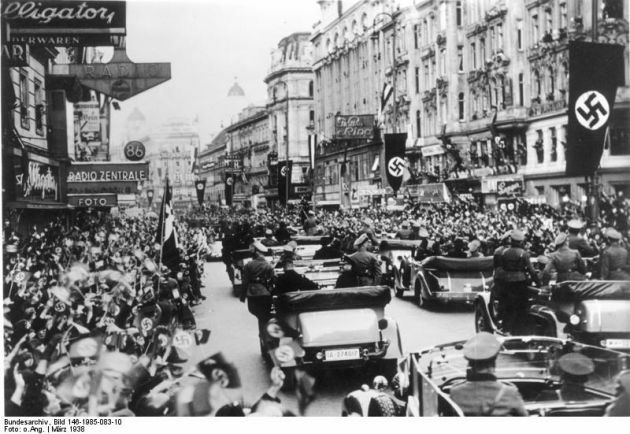 (Photo: German National Archive via Wikimedia Commons)Cheering crowds greet the Nazis in Vienna, Austria after the country joins the Third Reich in 1938 in what has become known as the Anschluss. Credit: German National Archive via Wikimedia Commons.